Pure Argentine Tango – nothing less! : another Tango Malvern exciting event just around the corner! another Tango Malvern exciting event just around the corner! How full and interesting a tango life we've been living these last few weeks. We had a wonderful time at the Tango Feast down in Devon with friends old and new and all led by Tara and Fernando, Jenny Francis and Ricardo Oria. Some beautiful dances too. Now we are madly organizing our next Tango Malvern event on November 14th, at the spectacular Feathers hotel in nearby Ledbury. We have been promoting salon style tango within our group, and have greatly enjoyed recent Monday night classes at Malvern with Loyd And Sandra from Birmingham. 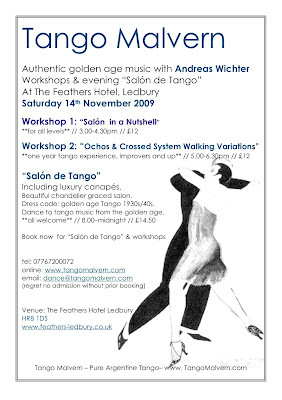 We are now looking forward to our first visit from Andreas Wichter and preparing for some wonderful in depth workshops doing just salon tango, beautifully.... so this time its 2 special workshops in the afternoon of November 14th, and then in the evening a destined to be glittering "Salon de Tango." all in the rather glorious Feathers hotel. We aim to have a truly fabulous time!